Cambo's UniTrack system is a stable and yet flexible platform for supporting your video dolly. The system can be stored folded for minimum storage space and ease of transportation. 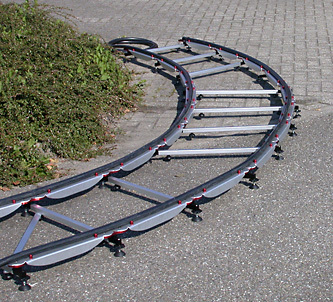 Straight tracks as well as curved tracks are possible with any shape or curve from straight into a tight radius . UniTrack is delivered in modular sections of 5 meter length, which are easily connecting to eachother to create the total length of your demand. Each hinge of the track system has a support block that allows for levelling the track each half meter if needed. Adjustable cross bars connect the left and right track supports and assure a constant width of the system when moving around and can be displaced when creating a tight curve. The Cambo UniTrack system can be completed with the optional Cambo Track Dolly and Cambo Pedestals. Cambo also supplies a dedicated Flightcase as accessory for each 5 meter section including the rubber tracktube rolled in.